Tiny stuffed-animal besties Mimi and Piggy take a long-awaited voyage to Venice. Being in an unusual, colorful, crowded city is exciting, but bunny Mimi reveals, “I felt so small and a little bit nervous” surrounded by all the people. Many youngsters, whether planning a major excursion or a trip to a new supermarket, will relate. Then the worst happens: Mimi and Piggy become separated! 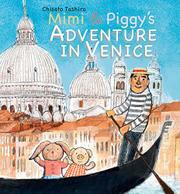 In her frantic search for Piggy, Mimi runs deep into Venice. Tashiro’s bright illustrations in pencil and gauche capture the details of the vibrant locale with its boats and bridges, tourists and souvenir shops, fish stalls and more, gradually turning to more somber sepia tones as Mimi reaches her low point. She comes to a stop, crying. That’s when a helpful boy advises Mimi to go back to the last place she saw Piggy. Once they’ve reconnected, Mimi can relax and enjoy the sights, which are depicted in inviting spot, full-page, and double-page-spread art. Keen-eyed observers will notice the boy smiling as the friends float past on a gondola before they go to a delicious dinner.